Colorful, beautiful, and so tasty — this Dragon Tongue Bean Salad is drizzled with a spicy honey-mustard dressing and is the perfect summer side dish for barbecues or a vegan main course. Dragon beans are unique and fun to work with. What are Dragon Tongue Beans? 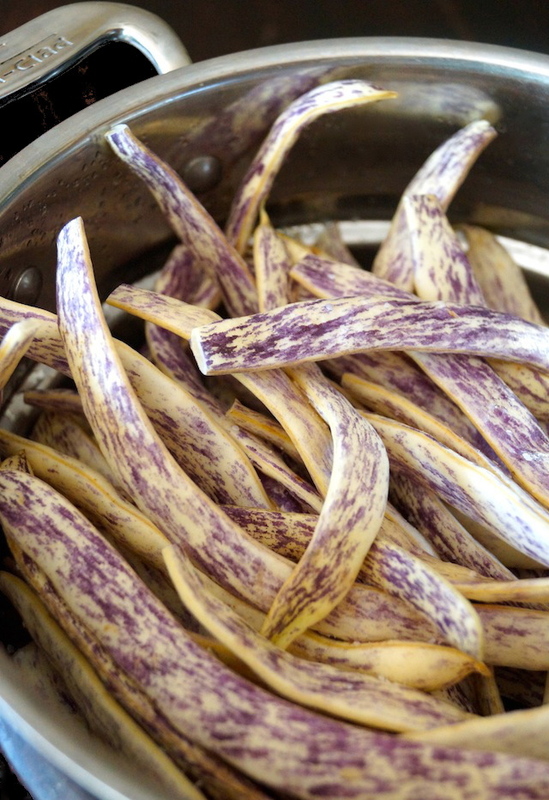 More commonly called Dragon Beans, these beans are uniquely colored with distinctive purple streaks and specs with a cream-colored background. Their pods are edible and they don’t have strings like many other beans. They’re considered a “Romano” variety of bean. The beans can be eaten raw or cooked. The smaller they are, the younger they were when they were harvested, and that’s when they’re best eaten raw. Dragon Beans are usually available May through September. What do Dragon Tongue Beans Taste Like? With a perfect crunch, they have a nut-like flavor and are subtly sweet. When my friends at Melissa’s Produce sent me a sample of the ever-so-stunning Dragon Beans, I wondered if I should use them in the kitchen, or simply set them out in a pretty bowl for display. Never having explored Dragon Bean recipes before, I decided on the cooking option, but loved looking at how pretty they were during the process. My Dragon Beans were fairly large — about 6-inches each. So in this Dragon Tongue Bean salad, as the main ingredient, I wanted to soften them slightly. Dragon Tongue beans are lovely steamed or quickly simmered. It intensifies their delicious nutty flavor. They will fade in color, but you will still see some purple here and there. Dragon Tongue beans are also perfect for pickling along with fresh herbs, spices, and other vegetables. You can also stir fry them with other vegetables. Dragon Tongue Bean salad has a wonderful blend of textures and colors and is the perfect scrumptious summer side dish for barbecues or picnic item. It will be the prettiest dish at the party and totally wow the guests! I love it served with all sorts of rich meat entrées too. You can likely find them in the specialty produce sections of markets like Sprouts, Whole Foods, Bristol Farms and Gelson’s. For more information from Melissa’s Produce about these cool beans, you can go here. And yes, if you can’t get your hands on these, of course you can replace them with green, yellow, or any others you’d like. The end result will still be divine. If you experiment with the beans, raw or cooked, and come up with your own Dragon Bean recipes, please share them in the comments. This pretty salad the perfect summer side dish for barbecues or a vegan main course. Dragon beans are unique and fun to work with. Add the vinegar, mustard, honey, chili paste, salt and pepper to a small bowl. Whisk until smooth. 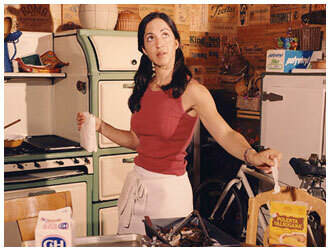 Gradually add the oil while still whisking. Once it's smooth, set aside. Prepare a large mixing bowl with ice water and set it aside. Place a steamer rack into a pot with the water level just below it. Over high heat, bring the water to a boil and then add the beans to the rack, sprinkle lightly with salt and cover. Steam just until they're about 50% more tender, about 3 minutes. Immediately drain and add the beans to the bowl of ice water -- this will help preserve any bits of purple still remaining. Let them sit in the ice water until they're cold, then drain, dry them, and add them to a large mixing bowl. Toss the beans with the micro greens and the dressing. Wash, dry, and slice the red chile peppers in half for garnish (and added heat) if desired. Now, this is totally a salad I’d eat. Love the added sherry vinegar in the dressing. Bet it gives it a nice little punch, yum! Hope you can find them, Sam. They’re delicious and fun. Thank you! I don’t think that I have ever heard of these beans before, but they look and sound very interesting! First time I have heard of dragon tongue beans and I hope to be able to source them soon – I love all kinds of fresh beans! I love the spice in the dressing – I am always adding some heat to my salads, stews, sammies, etc. I was going to leave my own comment, but felt I had to piggyback on Greg’s! I loved his geeky response. Where would the world be without amazing geeks like Greg? I finally found a purple vegetable that didn’t fade when cooked… Purple cauliflower! I’ve never heard of these beans, Valentina, but I will look for them at whole foods. Wonderful spring time recipe! We’ve been getting these in our CSA box, so I’ve been looking for new recipes – and we loved this one! I didn’t have sherry vinegar, so I substituted rice vinegar and it still turned out great. I also didn’t have the peppers to add the heat, but I’ll definitely add those next time!